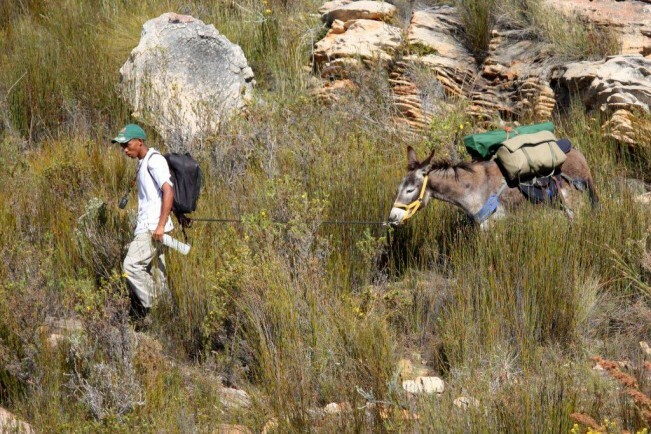 The Donkey Trail is a 30km, 3 night, two day, guided and fully catered hike into Gamkaskloof (Die Hel). The trail was started as a community development and animal rescue initiative and has become a popular hike with both local and foreign hikers. Trained guides from the local community accompany hikers for the duration of the trail and donkeys, also part of the history of the region, carry all gear to the tented site on the first day of the hike. The trail follows one of the original footpaths used by the inhabitants of Gamkaskloof and affords hikers the opportunity to walk through a UNESCO World Heritage Site and one of 35 Biodiversity Hotspots on the planet. The experience also offers fascinating cultural / historical insight into the lives of former inhabitants of Die Hel. The region traversed is also well known for it’s fascinating geological beauty. Meals on the trail are of the highest quality, catered from Aloe Aloe Restaurant in Groenfontein using only the freshest and locally sourced products. Trail snacks and biodegradable soaps and shampoos are provided. Accommodation the first night is in original Cape Vernacular styled cottages dating as far back as the 1820’s, the second night in a luxury tented site, for exclusive use of Donkey Trial hikers, on top of the Swartberg and the third night in delightfully restored “klowers” cottages on Cape Nature’s property in Gamkaskloof. Midweek and weekend trails are open all year but we dont operate during February and July/August due to extreme weather conditions. Warm conditions in December and January are alleviated by use of stunning mountain pools on the trail and at the overnight camp. Rates vary depending on midweek/weekends and the time of the year hiked. Minimum group size 6 and maximum 10. Our vehicle collects hikers in Die Hel to return to the starting point.